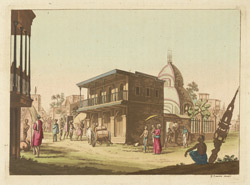 Coloured aquatint of a street scene with the Kalighat temple in Calcutta by Gaetano Zancon (1771-1816) dated c.1810. The temple of Kalighat was rebuilt in 1809 under the patronage of the Choudhury family at the site of a much older temple. The temple is dedicated to Kali, who represents the destructive side of Shiva's consort Sakti. Nineteenth-century European visitors to the city believed that the name Calcutta derived from the Kalighat temple.